NTRPG CON, Here I Come! This is the year folks! It's finally happening! After years of not getting to go, tomorrow, I will head back up to my home grounds of DFW and game until I drop. Hopefully, there also will be a decent amount of shopping, meeting people I've known only online or through podcasts, and making new gaming friends. Swords & Wizardry - Jillian Webb ??? I can't imagine there are any readers of my blog who are unfamiliar with Dyson's Dodecahedron. 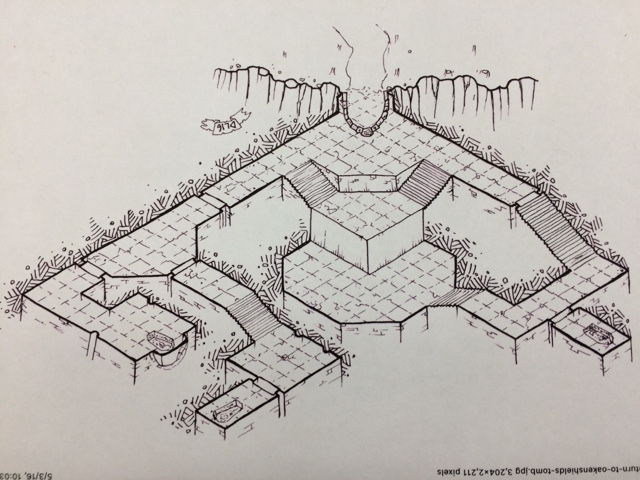 It's a must-read RPG blog -- and his lovely maps have gone isomorphic, which I simply adore as the most helpful kind of dungeon maps. 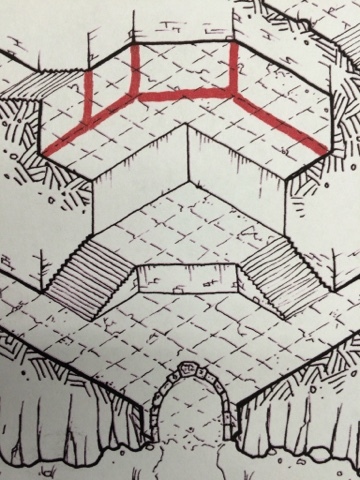 Recently as I was looking over one of Dyson's maps, I found a spot I couldn't rightly interpret, nor helpfully explain to Dyson my perception in the comments to get clarity. So I made some pictures to hopefully get across my problem to enable him to fix my understanding. The map is found at the top of this post: Return to Durahn's Tomb. At the top of the stairs to the overlook above the elevated niche to the entry room is where my interpretation problem begins. In the detail shot below, as I look at the right angle niche above the half-square dais or platform, the stairs appear to lead to an undifferentiated space. I can imagine that the red lines I've added below would differentiate the space, but they'd represent a sheer drop from the stairs which I doubt Dyson intended. In the detail shot below, I have added a landing for the stairs in green lines that turn into a gallery above a lower overlook, but getting those two spaces to make sense together is also not exactly obvious. 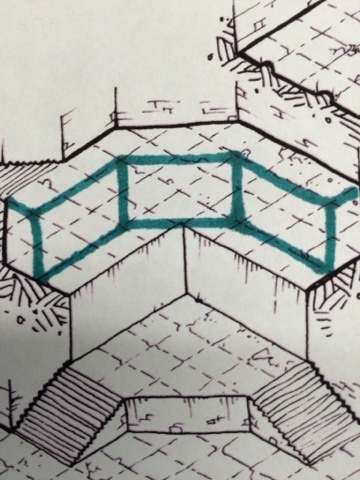 Funny enough, if I flip the entire image (below) the problem with that intermediary space disappears entirely and the area becomes an octagon, and the only things that then would need fixing are the sarcophagi and the main entrance. So, I look forward to Dyson's explanation, and I appreciate the time he spends sharing his labors with us foremost, but also in helping me get clarity. If you have never supported Dyson's work before, now is as good a time as any. If you're looking for a one-time purchase, I've enjoyed his Dyson's Delves II, but you could also contribute to his Patreon account to keep these works coming and released into the wild.